Skywatching (ISBN 0002200287) is an all rounder type of astronomy book which claims to be the Ultimate Guide to the Universe. This is the type of book a grandmother or aunt would buy you for your birthday or Christmas once they have learnt that you are interested in astronomy but this is not a bad thing, as Skywatching is a very colourful book with lots of very useful content and images. 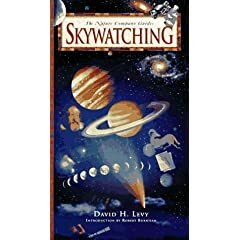 The first chapter of Skywatching gives a very good guide to sky watching through the ages, including the first sky watchers such as the Babylonians and the Chinese astronomers. This chapter also mentions Copernicus, Kepler and of course Galileo. Milestones during the 20th Century are also nicely covered from Einsteins publishing of relativity in 1905 to 1994 when the periodic comet shoemaker Levy 9 collided with Jupiter. Chapter two covers stars and galaxies, including dwarf stars, giant and super giant stars. This chapter also covers a wide range of sites to look for in the sky including nebulae, star clusters and galaxies such as M31, M33, M81 and M87. There is also a chapter on Skywatching Tools and Techniques; this covers naked eye astronomy, observing techniques such as using red lights for outdoor viewing and measuring sizes and distances using your hands. This chapter also takes you through using binoculars for astronomy and the different types of binoculars. It also contains information on the different types of telescopes and which is the right one for you. There is also a small section on eyepieces and on astrophotography and large telescopes. Chapter four entitled Understanding the Changing Sky, takes you through how to map the stars and how the earth spins and how the seasons are created. This chapter also discusses the phases of the moon, star brightness and colour, and solar and lunar eclipses, it also covers shooting stars and other lights in the sky such as rainbows and aurorae and haloes. Chapter five is a very large chapter which shows you how to use starfinder charts and it then goes on to describe each constellation in turn with a page for each, including a description and what to look for as well as a sky chart for each and what other exciting sites can be found in that constellation. Chapter six is a tour of the solar system and there are some great pictures and write ups about each planet and our moon, this chapter also covers comets and asteroids. This version of Skywatching that I am reviewing was reprinted in 1996, so that is quite an old book, but a lot of the content is still the same today, we still have the same constellations and planets to view, it maybe that we have now discovered more in the sky and technology has now improved, but Skywatching from Collins is still a very good book, what makes it especially good is because it is so readable and gives you the information without bogging you down in science, plus the number and quality of images in the book are great. Skywatching is the type of book for amateur astronomers who would go back and use the book as reference again and again.